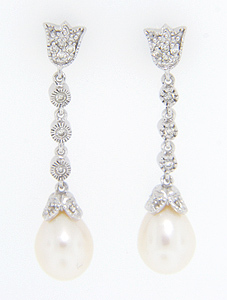 Smooth, lustrous pearls are the focal points of these 14K white gold and diamond earrings. Set with approximately .15 carats total weight of diamonds, the earrings dangle, sparkle and shine. The earrings measure 1 1/4" in length.